Part of being a Doctor Who fan is about collecting the merchandise associated with our favourite show; be it an action figure, a DVD, a CD, or a rare collectors piece. During the show’s rich 50+ year history, Doctor Who has created more pieces of merchandise than any other British TV programme, and the new ‘Doctor Who Memorabilia’ book by Paul Berry chronicles a surprising amount of it! Since the show returned to our screens in 2005, the floodgates opened to a whole new wave of merchandise, but for this particular book, Berry has wisely focused on the classic series and everything right up to the 2005 series. Split up into easy to navigate chapters, Berry kicks off with the various Doctor Who books that have been released over the years - as far back as 1964 with ‘The Dalek Book’ and as far ahed to the BBC Eighth Doctor and Past Doctor novels. It’s worth noting at this point how vibrant the pictures are (full colour of course), and it’s so good to come across a piece of merchandise that jogs a memory from your youth. Who could forget the Target books, or the annuals, and not forgetting The Doctor Who Monster Book! Chapter 2 covers the Toys, Models and Games released over the years - some of which are now incredibly valuable. The Cowan De Groot Daleks, Jigsaws, Dapol action figures and Big Chief statues all get a look-in. There’s also room for the classic series merchandise released in recent years from Character Options. Perhaps our favourite section is Chapter 3, which covers the Audio Visual releases. Who could forget travelling to your local WH Smith and seeing the vast selection of Doctor Who videos for sale, complete with all the stunning cover art by Alister Pearson, Andrew Skilleter and Colin Howard. There’s also an area dedicated to the Doctor Who DVD releases, as the merchandise transitioned into the 21st century. And so the book continues exploring other arms of the merchandising tree, including Comics, Magazines, Audiobooks & CDs, Cards and Collector pieces. Each area makes room for poignant pieces as well as harder to find and more unknown items. Even the most devoted of fans will find something they didn’t know about, here. Berry has clearly done his homework, and as well as introducing and presenting the various pieces, there are some great nuggets of information and facts along the way, too. One example being the fact that prior to the laserdisc rage being cancelled, artwork was produced for ’Spearhead from Space’, but sadly the title, and the artwork were never released. Although a relatively slimline book, sitting at just under 100 pages, it’s surprising just how much is packed into it! 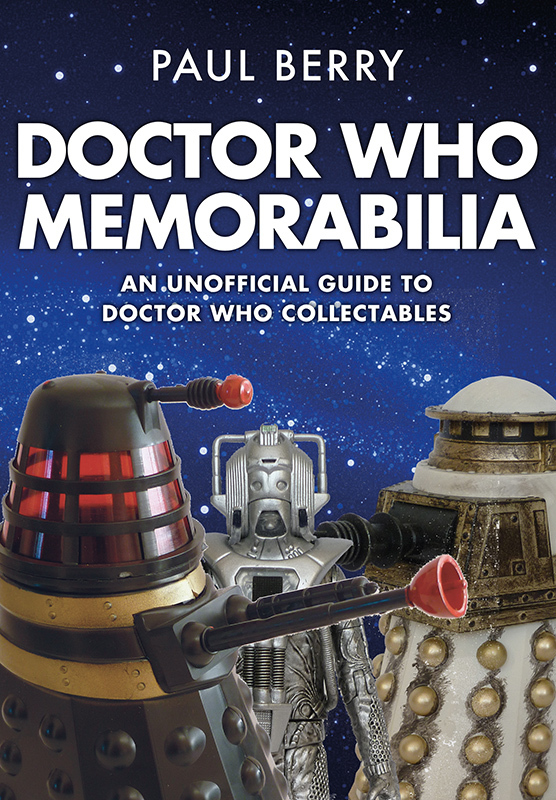 The Doctor Who Memorabilia book not only serves as a valuable guide to some of the key (and even more obscure) pieces of Doctor Who merchandise over the years, but it acts as a comforting trip down memory lane - a trip you’ll be happy to take over and over again. + Doctor Who Memorabilia is Out Now, priced £14.99. + Buy this book from Amberley Books for just £13.49! + Follow Amberley Books on Twitter.